Limestone: The specimen shown is about two inches (five centimeters) across. Most limestones form in shallow, calm, warm marine waters. 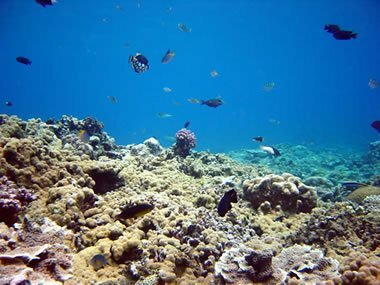 That type of environment is where organisms capable of forming calcium carbonate shells and skeletons can easily extract the needed ingredients from ocean water. When these animals die, their shell and skeletal debris accumulate as a sediment that might be lithified into limestone. Their waste products can also contribute to the sediment mass. Limestones formed from this type of sediment are biological sedimentary rocks. Their biological origin is often revealed in the rock by the presence of fossils. Today Earth has many limestone-forming environments. Most of them are found in shallow water areas between 30 degrees north latitude and 30 degrees south latitude. Limestone is forming in the Caribbean Sea, Indian Ocean, Persian Gulf, Gulf of Mexico, around Pacific Ocean islands, and within the Indonesian archipelago. The Bahamas Platform: A NASA satellite image of the Bahamas Platform where active limestone formation occurs today. The main platform is over 100 miles wide, and a great thickness of calcium carbonate sediments have accumulated there. In this image the dark blue areas are deep ocean waters. 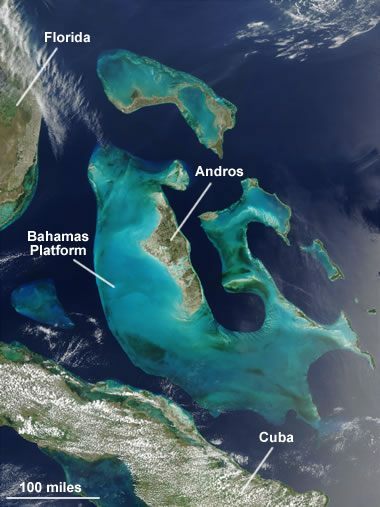 The shallow Bahamas Platform appears as light blue. Enlarge image. Limestone stalactite: A drop of water hangs and evaporates on the tip of a stalactite. National Park Service image. Limestone can also form through evaporation. Stalactites, stalagmites, and other cave formations (often called "speleothems") are examples of limestone that formed through evaporation. In a cave, droplets of water seeping down from above enter the cave through fractures or other pore spaces in the cave ceiling. There they might evaporate before falling to the cave floor. When the water evaporates, any calcium carbonate that was dissolved in the water will be deposited on the cave ceiling. Over time, this evaporative process can result in an accumulation of icicle-shaped calcium carbonate on the cave ceiling. These deposits are known as stalactites. If the droplet falls to the floor and evaporates there, a stalagmite could grow upwards from the cave floor. Limestone is by definition a rock that contains at least 50% calcium carbonate in the form of calcite by weight. All limestones contain at least a few percent other materials. These can be small particles of quartz, feldspar, clay minerals, pyrite, siderite, and other minerals. 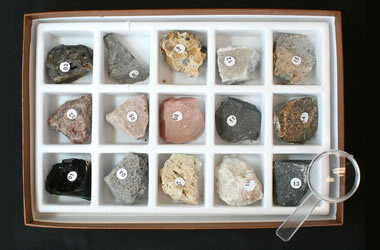 It can also contain large nodules of chert, pyrite, or siderite. The calcium carbonate content of limestone gives it a property that is often used in rock identification - it effervesces in contact with a cold solution of 5% hydrochloric acid. Chalk: A fine-grained, light-colored limestone formed from the calcium carbonate skeletal remains of tiny marine organisms. Coquina: This photo shows the shell hash known as coquina. The rock shown here is about two inches (five centimeters) across. Tufa: A porous limestone that forms from the precipitation of calcium carbonate, often at a hot spring or along the shoreline of a lake where waters are saturated with calcium carbonate. There are many different names used for limestone. 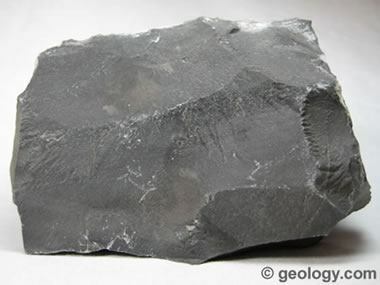 These names are based upon how the rock formed, its appearance or its composition, and other factors. Here are some of the more commonly used varieties. 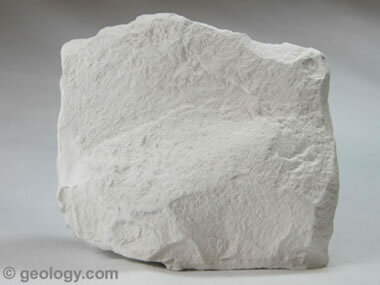 Chalk: A soft limestone with a very fine texture that is usually white or light gray in color. It is formed mainly from the calcareous shell remains of microscopic marine organisms such as foraminifers, or the calcareous remains from numerous types of marine algae. 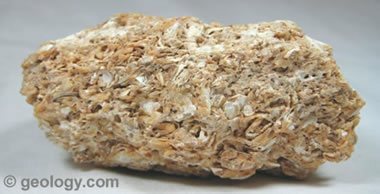 Coquina: A poorly-cemented limestone that is composed mainly of broken shell debris. It often forms on beaches where wave action segregates shell fragments of similar size. Fossiliferous Limestone: A limestone that contains obvious and abundant fossils. These are normally shell and skeletal fossils of the organisms that produced the limestone. Lithographic Limestone: A dense limestone with a very fine and very uniform grain size that occurs in thin beds which separate easily to form a very smooth surface. In the late 1700s, a printing process (lithography) was developed to reproduce images by drawing them on the stone with an oil-based ink and then using that stone to press multiple copies of the image. 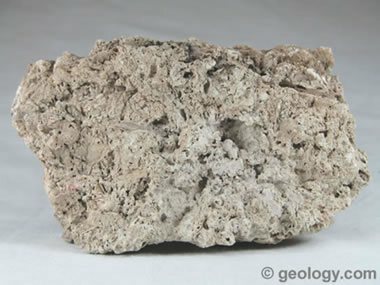 Oolitic Limestone: A limestone composed mainly of calcium carbonate "oolites," small spheres formed by the concentric precipitation of calcium carbonate on a sand grain or shell fragment. Travertine: A limestone that forms by evaporative precipitation, often in a cave, to produce formations such as stalactites, stalagmites, and flowstone. Tufa: A limestone produced by precipitation of calcium-laden waters at a hot spring, lake shore, or other location. Crinoidal Limestone: A limestone that contains a significant amount of crinoid fossils. Crinoids are organisms that have the morphology of a stemmed plant but are actually animals. Rarely, crinoidal and other types of limestone, have the ability to accept a bright polish and have interesting colors. These specimens can be made into unusual organic gems. This cabochon is about 39 millimeters square and was cut from material found in China. 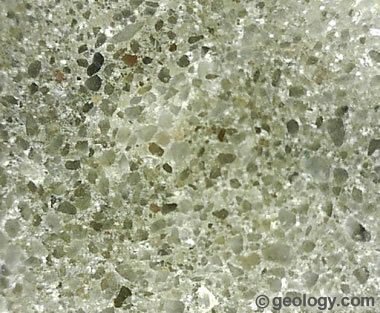 Arenaceous Limestone: This image is a microscopic view of a polished surface of the Loyalhanna Limestone from Fayette County, Pennsylvania. The Loyalhanna is a Late Mississippian calcareous sandstone to arenaceous limestone, composed of siliceous sand grains embedded in a calcium carbonate matrix or bound by a calcium carbonate cement. It is cross-bedded with features that have caused geologists to argue if it is of marine bar or eolian dune origin. This view shows about one centimeter of rock between opposing corners of the photo with sand grains measuring about 1/2 millimeter in diameter. The Loyalhanna is valued as an antiskid aggregate. When it is used to make concrete paving, sand grains in aggregate particles exposed on a wet pavement surface provide traction for tires, giving the pavement an antiskid quality. Limestone is a rock with an enormous diversity of uses. It could be the one rock that is used in more ways than any other. Most limestone is made into crushed stone and used as a construction material. It is used as a crushed stone for road base and railroad ballast. It is used as an aggregate in concrete. It is fired in a kiln with crushed shale to make cement. Some varieties of limestone perform well in these uses because they are strong, dense rocks with few pore spaces. These properties enable them to stand up well to abrasion and freeze-thaw. Although limestone does not perform as well in these uses as some of the harder silicate rocks, it is much easier to mine and does not exert the same level of wear on mining equipment, crushers, screens, and the beds of the vehicles that transport it. Roofing Granules: Crushed to a fine particle size, crushed limestone is used as a weather and heat-resistant coating on asphalt-impregnated shingles and roofing. It is also used as a top coat on built-up roofs. Portland Cement: Limestone is heated in a kiln with shale, sand, and other materials and ground to a powder that will harden after being mixed with water. AgLime: Calcium carbonate is one of the most cost-effective acid-neutralizing agents. When crushed to sand-size or smaller particles, limestone becomes an effective material for treating acidic soils. It is widely used on farms throughout the world. Lime: If calcium carbonate (CaC03) is heated to high temperature in a kiln, the products will be a release of carbon dioxide gas (CO2) and calcium oxide (CaO). The calcium oxide is a powerful acid-neutralization agent. It is widely used as a soil treatment agent (faster acting than aglime) in agriculture and as an acid-neutralization agent by the chemical industry. Animal Feed Filler: Chickens need calcium carbonate to produce strong egg shells, so calcium carbonate is often offered to them as a dietary supplement in the form of "chicken grits." It is also added to the feed of some dairy cattle who must replace large amounts of calcium lost when the animal is milked. Mine Safety Dust: Also known as "rock dust." Pulverized limestone is a white powder that can be sprayed onto exposed coal surfaces in an underground mine. This coating improves illumination and reduces the amount of coal dust that activity stirs up and releases into the air. This improves the air for breathing, and it also reduces the explosion hazard produced by suspended particles of flammable coal dust in the air. Limestone has many other uses. Powdered limestone is used as a filler in paper, paint, rubber, and plastics. Crushed limestone is used as a filter stone in on-site sewage disposal systems. Powdered limestone is also used as a sorbent (a substance that absorbs pollutants) at many coal-burning facilities.